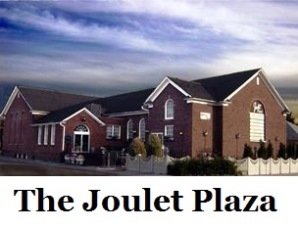 Get A FREE Brochure from "The Joulet Plaza"
Joulet Wedding and Reception Center is centrally located on the corner of West Elm and McKinley – Pocatello, Idaho. Joulet vows to help make the most important day of your lives even more special. We want your wedding to be a memorable experience. It is a time when friends and family come together to see two people unite their love in marriage. An occasion to be remembered the rest of your lives. We want you to feel special, the only two people in the world – a time to escape from reality. We want you to feel that your every need was met. There is an enchanted effect as you enter through wrought iron gates. You are greeted with flowers and a water fountain. There is a feeling of happiness and peace, and the garden atmosphere continues, entering the spacious double doors. Once inside the garden foyer, you are greeted by paintings of a castle, and statues of princes and maidens of a time gone by. Here you will also find a maiden fountain, following to a tree, arching of the entrance to the grand reception area. Entering the spacious reception area, you find a corner gazebo, accented by the haunting atmosphere of lighted backdrops. Every nook, cranny, and corner offers picturesque backgrounds for candid and professional photos alike. Enjoy socializing with all your dear friends and loved ones while basking in the warm glow of the nine gorgeous chandeliers and antique maiden statue candelabras. If the spirit of the moment so moves you and you feel the rhythm of the music, take to the golden oak dance floor and whirl to your heart’s content. Then take a seat for conversation and relaxation on the elegant white chairs, and at the crystal clear glass tables. If you have a musician in the party, they may want to entertain your guests at the conveniently placed piano in the reception room. When the big moment arrives, the bride descends from her spacious bridal room on a gorgeous circular stair. Flowers, mirrors, and archways add to the romantic setting. The people in the chapel will gasp as the beautiful bride appears at the top of the stair. The chapel offers large capacity with regular church pews. Lighted backdrops cloak the bridal party with a glowing effect. For your musical pleasure, and to create that special mood, you have your choice of either grand piano, organ, or instrumentation of your choice. After the sacred ceremony concludes the dual aisles make it possible for the bride to be seen coming and going. The groom makes his entrance quite discreetly from his personal passage from the front of the chapel, always at the perfect moment to receive his bride. The non-denominational chapel is the perfect place for your wedding, and prices at Joulet are unbelievably low.